Very comfortable two bedroom apartment in the Port Royale complex of Los Cristianos with a lovely sunny balcony. Near to bars and restaurants and only a short walk away from resort centre. This lovely privately owned two bed apartment to rent is located in the ever popular complex of the Port Royale Los Cristianos. It benefits from a lovely sunny double terrace with plenty of room to stretch out and enjoy the Tenerife sunshine! Enjoying a great position at the front of the complex (without too many steps) it this has become a very popular apartment to rent within Port Royale. PLEASE NOTE - After reading recent reviews, the apartment has undergone some recent modernisation (Nov 2018). This includes new a 3 seater and 2 seater sofa, microwave, replacement (aluminium) patio doors, new vanity unit in the bathroom, new curtains, towels and bedding. The photos on the advert show the new / modernised apartment which is looking better than ever. Port Royale has its own communal pool and large sun terrace with free sunbeds. The complex has an italian restaurant (and take-away) on site and has a launderette. It is located adjacent to two large 4* hotels which provide excellent evening entertainment programmes and full sport facilities (including bowling, tennis, sauna etc). The beach, harbour and central Los Cristianos is a 15 minute stroll away. A good selection of bars, restaurants and supermarkets are within 5 mins walk. This is definitely the more upmarket area of Los Cristianos where some of the best restaurants can be found. Lounge: Two sofas (one sofa bed), satellite TV (BBC, ITV, CH4, Sky and many more! ), DVD, coffee table, ceiling fans, patio doors to sunny balcony. Kitchen:Full size oven, hob, microwave, fitted fridge, washing machine, breakfast bar and stools. .
Master Bedroom: Twin beds (shown in photos as pulled together), bedside tables and lamps, large fitted wardrobes, hairdryer, ceiling fans, patio doors to balcony. Ensuite bathroom: Bath with overhead shower, WC and basin. 2nd Bedroom: Twin beds, bedside tables and lamps, fitted wardrobes and ceiling fans. Family bathroom: Bath, shower, WC and basin. Both bathrooms are modern and fresh. Balcony: Large double balcony with an abundance of sun. Patio table and 4 chairs and sun beds. Complex Facilities: Swimming pool (heated in winter), sun beds and parasols (free of charge), on-site Italian Restaurant and bar, launderette. Linen Change: Towels and linen change weekly. Location: 25 minutes from Airport. (Taxi meet and greet service available). 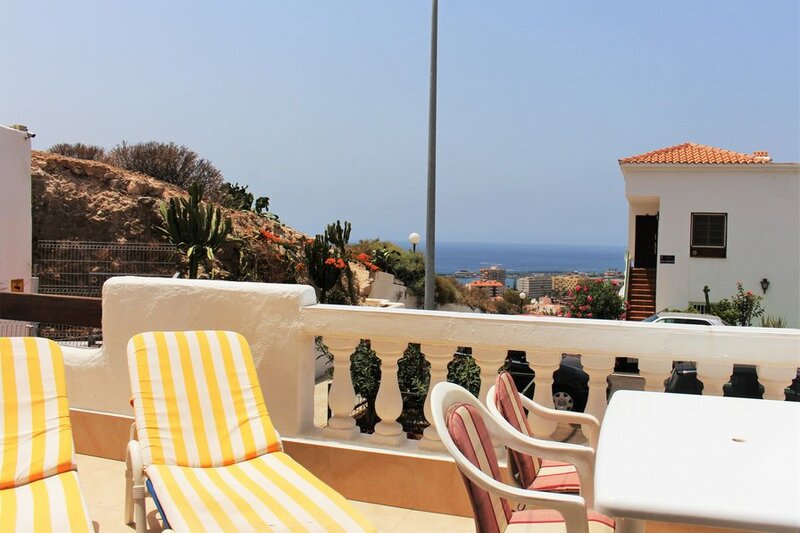 10 to 15 minutes walk to Los Cristianos harbour and beach. Ideal location for the water park. Two golf courses within 10 minutes drive. This apartment is looked after by a local Management company whos details will be given to you. They are local and available should you need them during your stay. A taxi transfer from the airport can be provided.